BenQ has steadily been expanding its portable data projector line of late and while the 1.8kg weight of the CP220 (£680 inc. VAT) isn't exactly ultraportable, it's a compact and tidy box that comes with its own carry case and the bare minimum of cables to get you by. The styling of the unit is contemporary, with the zoom and focus rings built into the casing, along with the lens cover, which is always a good idea. Control keys on the top of the unit are made from a single piece of die-cut aluminium, which stops protruding buttons getting crushed in transit. With a default 1024 x 768 pixel resolution, it'll natively source with most corporate laptops, and with a native 4:3 aspect ratio, images are big and sharp. If you use a widescreen laptop, you can form the resolution into 16:9 at the push of a button, but we found the image a little too stretched for presentations. It looks much better when running a DVD movie. This isn't the quietest of units and comes with a 35dB rating, which will drop down to 31dB when in eco-mode. In use we found it quite loud, with a slight rattling noise, so not the best unit to use in quiet environments, but in a busy office it'll be fine. With a 2200 ANSI lumens rating, supported by a 2000:1 contrast ratio, you'll be able to use it in any office without the need to dim the lights, as we found colours sharp when using it for a presentation. The BenQ CP220 isn't ideal for every occasion. 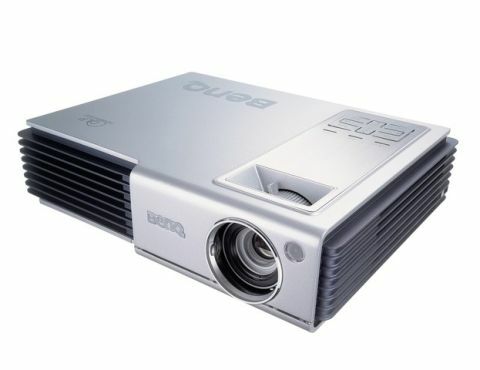 We wouldn't want to use it long- term as a home projector, for instance, but as an office tool it delivered stunning quality at an attractive price.